i just got back from an extremely spontaneous and short trip to Berlin. It was amazing! 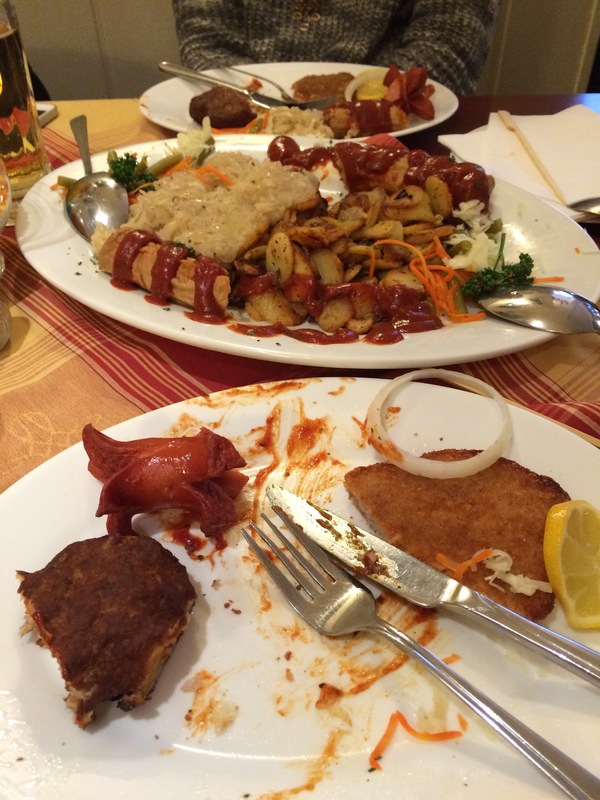 While there, we ate at two really great restaurants, Hasir (Turkish) and Schogl’s (German). I loved every bite. 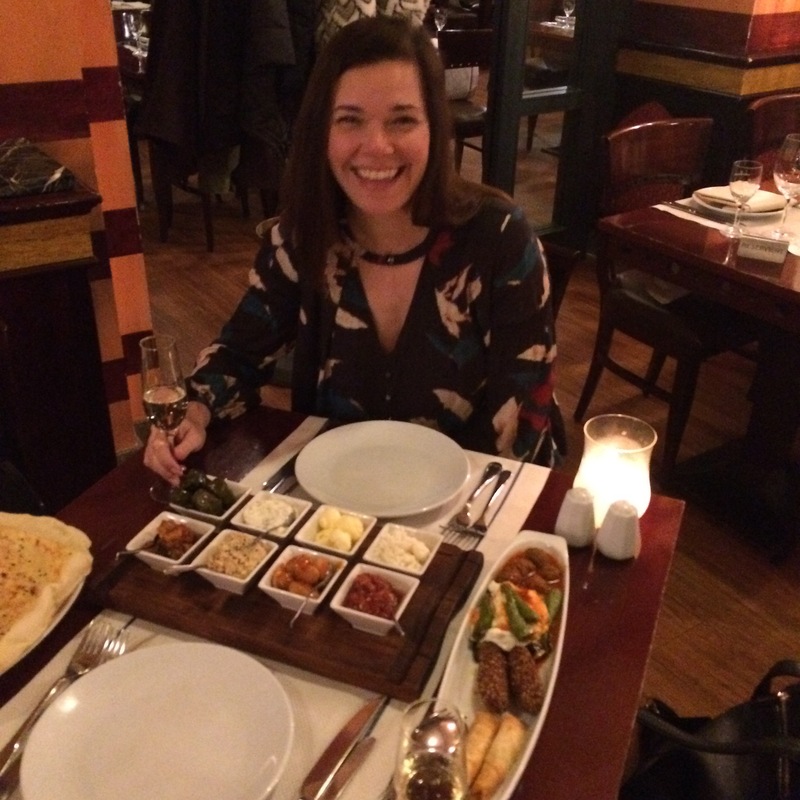 Amazing Turkish meal at Hasir in Berlin. 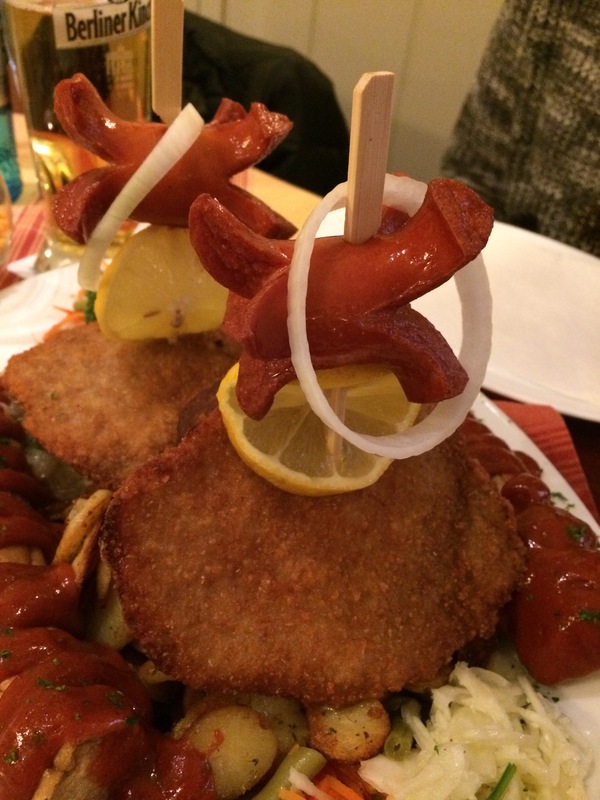 This crazy smorgasbord of schnitzel, sausage, fried meatballs, and currywurst. I was so sad I couldn’t finish every bite. One day soon, I’ll try to make all the amazing Turkish dishes (there were 12 not including the grilled meats that came next). 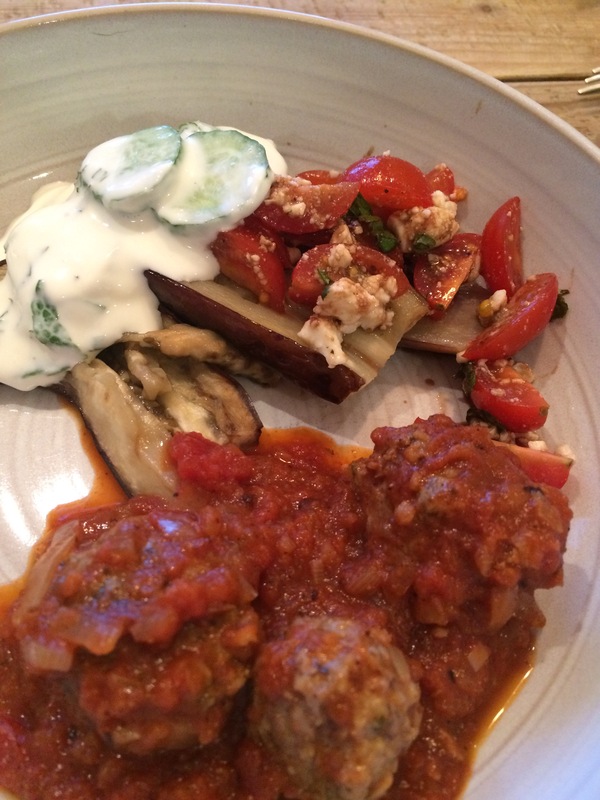 But this time, I just tried to tackle the lamb meatballs in sauce, taziki and roasted eggplant with yogurt and tomato salad. The meatballs were spot on. I’m still working on the eggplant. How do they get that warm yogurt so fluffy? Mix bread and egg together in a small bowl to soften the bread. In a large bowl, combine the lamb, onion, mint, cumin, salt, pepper and allspice. Mix with your hands until well combined. Then add in the egg and bread and mix thoroughly again. Shape meat into walnut size balls. 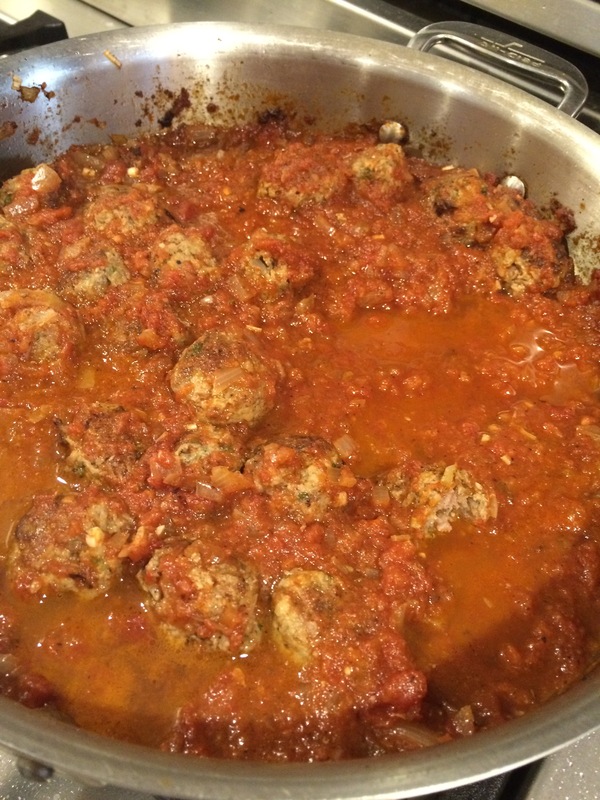 Put olive oil into a large frying pan and put in meatballs. Brown on one side and then the other, then remove from the pan and put on a plate. Reserve drippings for sauce. 1 large can (28 oz) crushed tomatoes. Reheat the drippings in the skillet and add 1 Tablespoon of olive oil. Add onion and garlic and saute until onion is soft. Add tomatoes, lemon juice, balsamic vinegar, sugar and allspice to the pan, mixing thoroughly. Taste for sweet sour balance adding more sugar if necessary. Bring to a boil, scraping the bottom of the pan. Blend about 3/4 of the sauce. Return to pan and add the meatballs. 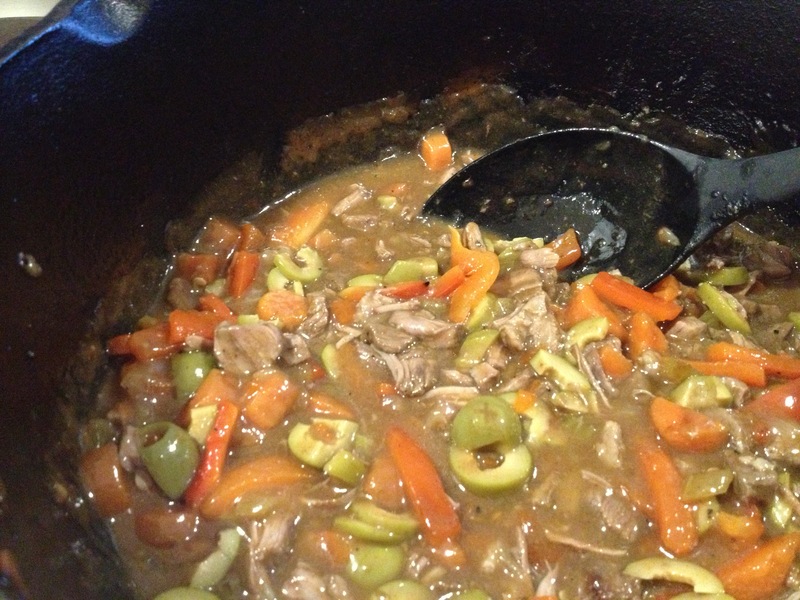 Simmer slightly covered on low heat for 15 – 20 minutes. Eat with lavash and taziki. Mix together and season with salt to taste. So, I didn’t try to fry a whole bunch of meats for our German meal recreation. Although, my hubby would’ve loved that!! Instead, I went for just the currywurst. How the heck haven’t I had that before?? 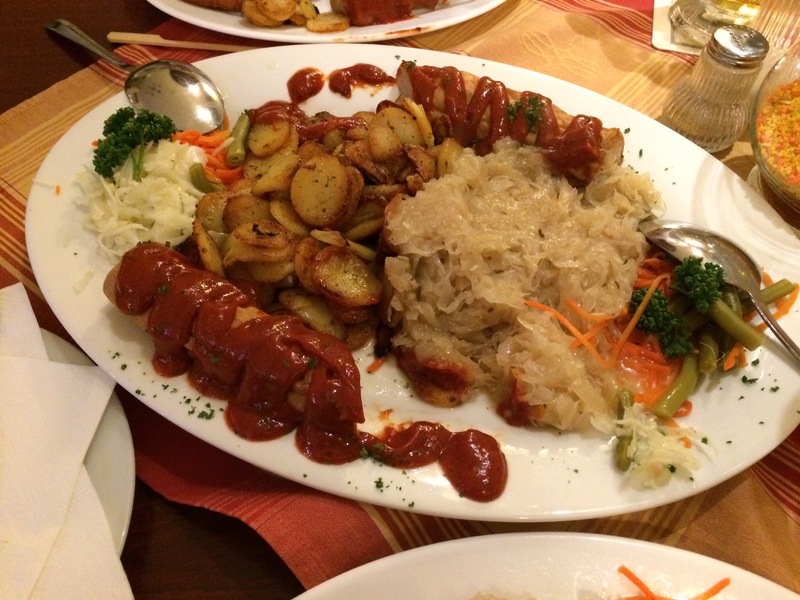 Mix together, heat and douse over bratwurst. 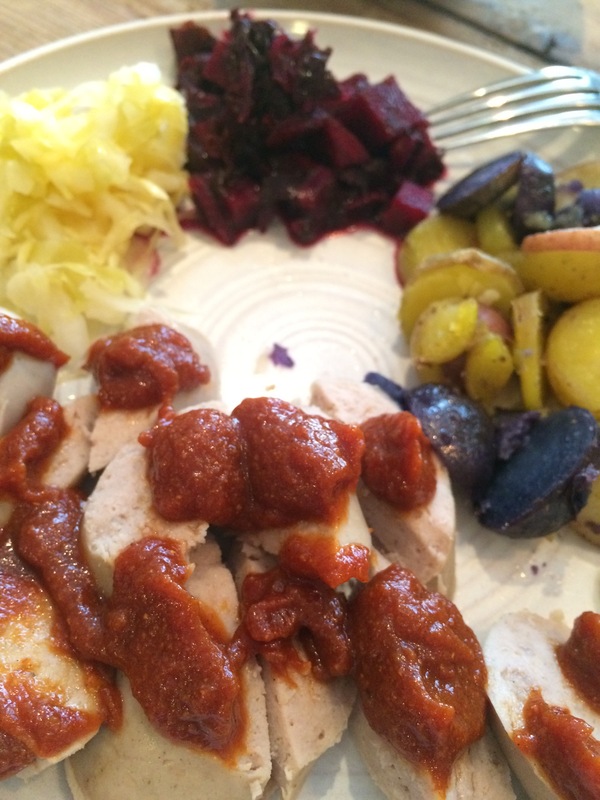 Serve with pan fried potatoes, sauerkraut and pickled beets.